The club's academy shared the news on Twitter, saying it was "quite simply what dreams are made of". 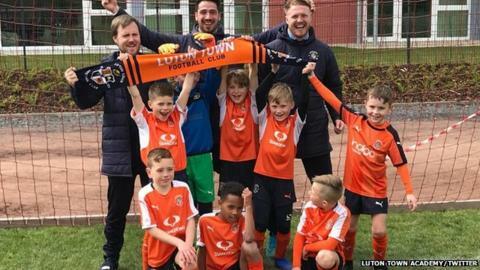 "It's fantastic to see the young boys doing so well in their tournaments abroad, flying the flag for Luton Town," Hatters manager Mick Harford told BBC Sport. "To beat a famous name like Juventus in the final is a wonderful achievement and seeing things like that inspires myself and the first team players, including lads like [21-year-old defender] James Justin who has been part of these tours as a youngster." Luton Town's under-9s beat Barcelona to reach the semi-final of their tournament in Poland. "It shows the future is very bright at this club and what a fantastic job the academy coaches do," added Harford. Luton Town's 1st XI lost to Charlton on Saturday but are top of League One with a guaranteed play-off place.